Members of the Internet workgroup include, from l., Joel Packman, DCPEA; Bob Foiles, DCP; Billy Lewis and Mike Young, DCPEA; Richard Harron, DCP; Larry Anzich, John Sabo, Ed Rose, Ben Dean, Bruce Carter and Javier Bustamante, all of DCPEA. Not pictured are Mike Naver, DCPEA, and Henry Senatore, DCO. Photo by Kevin Reals. •	Pre-1993 - Prior to introduction of the Worldwide Web at SSA, the agency initially had an internet presence via dial-up E-mail (circa 1988) and USENET Newsgroups (circa 1990). E-mail services were limited at first to a small group of users of the Office Support System in SSA’s Office of the Deputy Commissioner for Policy and External Affairs (DCPEA), the first desktop computer network at SSA; when SSA introduced agency-wide E-Mail (circa 1991), the older system and the new one were linked. At about the same time, File Transfer Protocol (FTP) and Gopher services were added. These services were text based protocols that allowed the public to request selected documents to be downloaded via the Internet to their local computer. The public was also able to request, via specially worded e-mail messages, public documents to be returned via E-Mail. The services originated in DCPEA and featured many common publications now associated with OCOMM, International Policy and other publications including the Social Security Handbook. The service and servers, were initiated, managed and maintained by DCPEA and the primary contributors were Tim Evans, Mike Young, Bruce Dull, Ben Dean and Billy Lewis. This staff also registered the domain ssa.gov in 1988. John Sabo, as the Executive Officer of DCPEA, was responsible for the “systems” of DCPEA and loosely oversaw this effort. •	Fall 1993 –Tim Evans, who had subsequently left SSA, brought a data tape to the SSA in a fall 1993 lunch visit with Billy Lewis that contained a copy of the web site (and server software) that he had built at DuPont, his new employer. Mosaic, the first Web browser to display images inline with text, had been introduced by National Center for Supercomputing Applications (NCSA) at the University of Illinois Urbana-Champaign in 1993. The systems administrators made John Sabo aware of this release in late 1993, and he immediately saw a benefit in using the newly configured SSA Web server to provide information on Social Security’s programs in a graphical format that the public would be able to access using the Mosaic browser. John Sabo introduced Bruce Carter, a staffer in the front office of DCPEA, and Javier Bustamante (JB) in charge of the SSA’s Spanish staff in the Office of External Affairs to Mosaic and the World Wide Web and suggested that they work toward the goal of developing a public Website for SSA. Excited by the idea, they both went outside of their job description and began building a Website. JB also saw the potential of the Web for other languages as well. He was heading the staff responsible for Spanish translations of public documents and saw the potential to reach the Spanish-speaking population through a public Website. Bruce and JB had met while working on another project and decided to combine forces to launch a SSA Website. By reviewing published Websites, Bruce and JB learned basic Hypertext Markup Language (HTML) and began coding popular Office of External Affairs publications, both in English and Spanish, and posting these documents on ssa.gov. At this time DCPEA had a UNIX-based desktop solution for their employees. Coding of the publications was done using the UNIX text editing program Vi and were coded directly on the server using a protocol common at that time called Telnet. As the Web was a graphical interface of the Internet, JB and Bruce approached a graphic artist in EA, Sheldon Cohen, the SSA Art Director, to design a logo for the Website. He completed the design in approximately 10 minutes and the design was used for nearly 2 years. •	December 1993 – After posting approximately 40 common publications, John Sabo wanted to do a demo for management and propose that the Website would be taken live. A demo for the Principal Deputy Commissioner, Larry Thompson was scheduled. Upon completion of the demo, Larry decided that the amount of content was inadequate and should be supplemented before public release. It is important to note that at this time, the SSA Website was “public”. Anyone pointing the Mosaic browser at www.ssa.gov would be able to see the Website. However, the availability of the Website and not being publicly announced its existence was generally unknown. In the early days of the World Wide Web, the primary means of announcing a new Website was on the What’s New page of the NCSA. 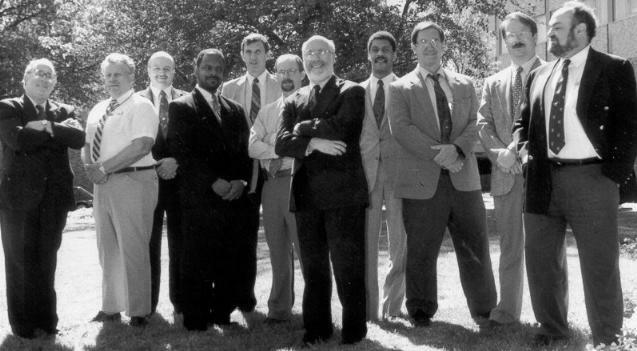 •	Dec 1993 – May 1994 – In preparation for a public announcement, John Sabo, Bruce Carter, and Javier Bustamante began making the rounds of different offices at SSA to convince them to provide public content for the Website. In this time a fuller team was formed to manage the servers, prepare content and generally promote the Website within SSA. See http://www.socialsecurity.gov/history/netteam.html for a list and photo of this team. Since some offices were lukewarm to the suggestion often citing lack of staff to code documents for public display on the Web, Bruce and Javier offered to take responsibility for all coding, removing one of the obstacles. Other offices were not convinced that “senior citizens would ever use the Web”, but were also swayed by the fact that they did not need to dedicate any resources to the effort. Additional content was added, including Legislative Bulletins and a current Trust Fund report. Jim Kissko, the Director of the Office Of International Policy wanted to share all of SSA’s Totalization Agreements on the Web and so became an early adopter. Another demo was scheduled, this time for Commissioner Shirley Chater and Larry Thompson. Ms. Chater approved the site and so a public launch was scheduled. Bruce Carter prepared a public announcement to be posted by the NCSA on their What’s New page. The Social Security Administration (SSA) is now part of the World-Wide Web. Look at Social Security's WWW server for public information pamphlets (including many in Spanish), about Retirement, Survivors, Disability and other SSA programs, the status of the SSA Trust Fund, legislation affecting SSA, information on SSA's international programs and statistical information valuable to researchers. The month of May 1994 saw approximately 17,000 public visits to SSA’s new Website, while still maintaining small amounts of traffic to SSA’s FTP and Gopher services. •	May 1994 – March 1995 – Bruce Carter was named SSA’s Webmaster. Offices began sharing content with the Web team for publication. For example, an agreement was reached with Tom Margenau of the Press Office to share every Press Release so that the team could publish it on the Web concurrent with its paper release. Other offices immediately saw the value of the Web to their mission. Larry DeWitt, the SSA Historian, was an early adopter and asked Javier to develop a History page for the web. JB did so and soon a feature on the home page that proved to be very popular was This Month in Social Security History. Content expanded rapidly as offices saw little downside to offering their publications electronically. Much, of this content was translated to Spanish by Javier and his staff and posted on the Web. The SSA Spanish website was the first developed in the Federal Government and by 1997 as many as 40 public information materials in Spanish were available on the web. Javier taught Grissell Hausman HTML coding and she became a primary coder for External Affairs publications in both English and Spanish. There was also an effort during this period to publish SSA forms on the Website. Spurred by the Internal Revenue Service success at posting most of their public use forms on their Website, Bruce began meeting with the Office of Publications and Logistics Management (OPLM) to encourage them to post SSA’s public forms on the Web. Also part of this effort was Joe Salis of EA, who was taking the role of developing SSA’s Intranet. OPLM were very resistant as the staff seemed to feel that they would somehow lose control of the forms publishing if they allowed electronic versions of their forms on the Web. After much negotiating, SSA convinced them to allow one form to be published, the SSA-7004 Request for Personal Benefits and Estimate Statement (PEBES). To measure the public’s use of the Web version of the SSA-7004, Bruce negotiated with the Wilkes-Barre DOC to setup a separate mailbox for the SSA-7004 Web version. This address was printed on the form that was hosted on the Website and based on mail to this box, use of the Internet version was slow, but peaked dramatically in a few months. Upon investigation, it was determined that the company Intuit had included a form SSA-7004 in every copy of their popular money management program Quicken. They had used the Internet version of the form, creating the significant uptick. SSA discontinued tracking use of the form by mailbox count. During this period the Internet team began working with the Health Care Finance Administration to develop a Medicare Website. Because Social Security benefits and Medicare are closely intertwined, it was felt that providing Medicare information off the SSA Website was logical. The content was prepared and submitted by HCFA employee, Tom Anzalone, and hosted on SSA’s Web servers. Later, HCFA, developed a standalone site but continued to host on SSA’s servers until 1998. •	March 1995 – March 1996 – Other forms followed and by March 1995 about 10 (out of 300 possible) forms were online at Social Security Online. The next logical progression to online services was to provide the public with a means to complete and submit forms online. John Sabo believed that an online version of the SSA-7004, Request for PEBES (latter renamed Social Security Statement) was the most logical choice. Working with the Office of Systems, a team was formed headed by Loretta Letke of the Office of Systems Requirements (OSR) to build the application. The application allowed the public to request a PEBES using an online application; the results would be mailed to their home address as provided by the user. The application was hosted on a special applications server in the National Computer Center (NCC); the first Web content hosted outside of DCPEA. SSA entered the online Statement in the Internet Commerce Expo in Anaheim, Ca. in March 1996 where it won "BEST OF CLASS" in the Government/Public Administration category. The online PEBES request was the first online application by any federal government Website. Also in 1995, Vice President Al Gore, along with the National Performance Review, honored Social Security's Team Internet with the prestigious "Hammer Award" for their work in developing Social Security Online. And, The May issue of PC/Computing Magazine cited Social Security Online as one of the "101 Best Net Bets," describing it as one of "the most interesting and useful" places out of the "more than 2,000,000 sites on the Internet." The year 1995 also saw a profound shift in the administration of SSA’s Website. In its first year of existence, the site hardware, software, and content were managed and controlled by DCPEA staff. The software for hosting and searching the site were freeware products that were not adequately supported. As DCPEA shifted from a UNIX environment to a Windows platform, DEPEA employees looked for other ways to keep the Website up to date without using Vi on a Telnet connection. Bruce purchased 12 copies of an early HTML editor, Hot Dog Pro and distributed it to the main content contributors. Using this product, or a Windows text editor, Web team members could code new documents, edit existing ones, and then upload directly to the public server using File Transfer Protocol (FTP). There were, at this time, no blocks to outside FTP, so the Web team could upload files from their home computer, if they wished. The Deputy Commissioner of Systems (DCS), Renny DiPentima, became concerned by the lack of security and assigned a team to transition the Web hosting from DCPEA to DCS. To accomplish this, Billy Lewis was hired from DCPEA and began meeting with the Web team to plan the transition. There was initially resistance, especially by John Sabo, but the transition was inevitable. The changeover took place in November 1995. Two identical Unix servers were spec 'd out, configured and installed by Mike Young in the National Computer Center (NCC) to be the only SSA Internet servers. Within days of going public, Mike Young quickly determined that the originally used Apache web server software was inadequate to support the millions of hits to the web servers causing them to crash repeatedly. He replaced it with Netscape's Web server software and that became the SSA standard for years to come. Because of the lack of UNIX-based Web server expertise, Mike Young, still in DCPEA, was given root access to the servers to be the system administrator and troubleshooter. This was an unusual move by the Office of System but the arrangement continued for at least 3 more years. One upshot of the move to the NCC was that it was no longer permissible for Web developers to write new files to the public server. To facilitate the loading of new content, DCPEA set up a “mirror server” on the internal network (mwww.ssa.gov) that exactly replicated the public server. Web developers could FTP their files to this server and it would in turn move the files to the public server once per hour. This process is still in existence. The mirror server served another purpose. In the early days on SSA’s Internet service, our field employees did not have access from their desktops to the Internet, but they did have access to the Intranet. This permitted field employees to view the content of SSA’s Website in case they received an inquiry from the public about something that they saw on the Web. •	May 1994 – August 1998 – From the first, Social Security Online encouraged the public to “Provide Feedback”. The original intent was to allow the public to comment on our Website and DCPEA review and respond (if necessary) to any public comments or questions. In 1994 – 1995, this was a manageable workload, receiving about 150 inquiries per month. However as this grew and the questions became more program-related, it became clear that DCPEA could not handle all of the inquiries. In early 1996, a small branch of the Office of Public Inquiries (OPI) offered to answer inquiries. Within a few months the volume had grown to more than 500 per month and OPI requested relief from the workload. Bruce met with the Office of Central Operations who dedicated a staff of about 30 people, at their peak, plus extra employees from the Wilkes-Barre DOC to answer inquiries. As of August 2008, they were handling more than 50,000 inquiries per month. DCPEA continued to review a sample of inquiries to determine the public’s reactions/problems/questions. •	1995 – April 1997 - After the success of the Online Request for a Social Security Statement, the Web team worked to develop addition online applications. Using the same model and also led by Loretta Letke of OSR, various teams developed applications to request a benefit verification, request a replacement Medicare card, and request a replacement 1099. The logical next step was to create an interactive online application where the user could not only make their request online, but receive their results online. And so began the development of the Interactive Social Security Statement where a user could receive and immediate, online readout of their lifetime earnings. This presented additional security problems since results were online and not mailed. The application was developed so that the user was required to match 5 elements with data SSA already knew about them from their application for a Social Security number – name, date of birth, place of birth, mother’s maiden name and their correct SSN. This was launched in some test markets in early 1997 and nationwide in March 1997. There was swift reaction to the service – the public loved it and comments soared with more than 95% favorable. But the experts complained that the security elements were too common to be only known by the requestor. Within 35 days, the service was withdrawn. Then acting Commissioner, John Callahan, directed that a series of public meetings be held to solicit input from the general public, security experts and privacy experts. A report was released that made recommendations on how to bring back the service, but they were never acted upon. As part of the process of development of all future online application, SSA sought input from privacy and security experts prior to implementation. In 1996, SSA discontinued is public “anonymous” FTP and Gopher services. In June of 1997, Javier’s Spanish staff produced a Kids page, one of the first pages dedicated to explain Social Security to children. •	1998 – A redesign of the Website was completed in 1998 using design services developed by a contractor. This was the last redesign done by an outside company. •	1999 – There were two significant events affecting SSA’s Web services in 1999 – the introduction of the Frequently Asked Questions (FAQs) feature and the rise of Baby Names. The FAQs were based on a software product purchased in 1999 from the company RightNow Web. The product allowed the public to search and rate answers, and provided a mechanism to be notified when the content of a FAQ changed. The original FAQ software populated the site with static FAQs taken from the Website. By 2003, there was an elaborate management process for reviewing and updating all FAQs one per year. In 2008, SSA was receiving about 3 million monthly views of more than 600 FAQs. While reviewing Web metrics in 1999, the Web team noticed a significant amount of traffic on an obscure Actuarial Note on the distribution of baby names in the US population as determined by a review of the names used on applications for Social Security numbers filed each year. The Actuary responsible, Michael Shackleford, noticed that Websites devoted to baby names often linked to this actuarial study. This prompted the Web team to highlight the Baby Names feature on the Website and tie it to other services that SSA offers. In May 2002, Javier’s staff produced the first Baby Names site. To this day, it remains one of the most popular features and is proudly announced by the Commissioner every Mother’s Day. •	2000 - 2001 – As various SSA reorganizations took places, the Office of Public Affairs became a standalone organization, separate from what was ODCPEA. The new organization, the Office of Communications (OCOMM), felt that as the public face of SSA, they should have primary responsibility for the content of Social Security Online. The transition was effected and Javier Bustamante was named SSA Webmaster. This transition occurred over a few months and a new management structure for the Web evolved into the Web Steering Committee (WESCO), co chaired by Javier Bustamante and Bruce Carter. In January of 2001, Javier and his Internet staff completed their first redesign of the Website after taking responsibility for the “look and feel” of the Website. Also in 2001, the first online claims application – for retirement benefits – was launched. Although it had been in planning stages for some months, its launch was hastened by then-Acting Commissioner Bill Halter, who wanted the online application implemented as soon as possible. Bill Halter was also responsible for implementing a monthly email Social Security newsletter developed by the Office of Communications and called eNews, written by OCOMM and released to the public who had subscribed online. Visit Social Security's 'What You Can Do Online' Webpage. 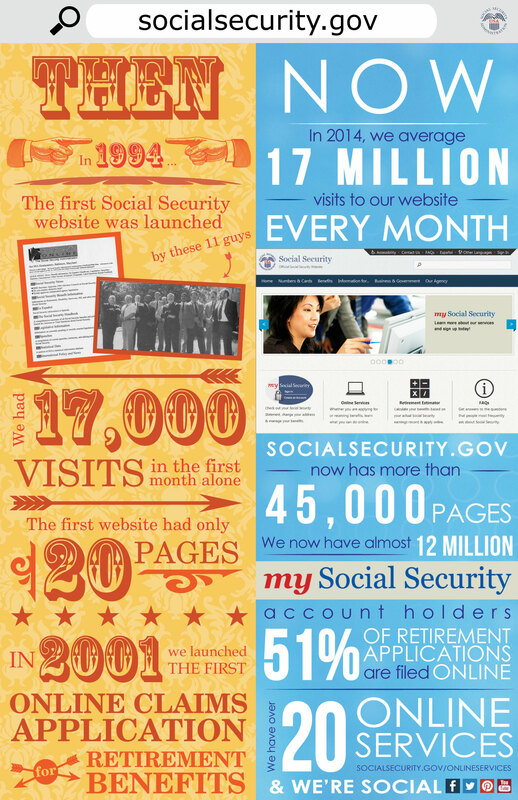 This infographic was used on SSA's Facebook page to commemorate the 20th Anniversary of Social Security's internet presence.